Cops took a man’s guns and nearly 28,000 bullets. His family claimed he “heard voices” and was a danger to himself and others. He was free within days. Now he’s the prime suspect in a woman’s shooting. What happened? OnJuly 31, police resolved a tense, 15-hour standoff at 2443 15th St., but not before an elderly woman was shot to death in the home and her potential assailant, a 52-year-old man, purportedly turned the gun on himself and was spirited to San Francisco General Hospital. It’s hard to find fault with the actions of the San Francisco Police Department, but it was a dispiriting day for them nevertheless. Because they’d already been to this house, a stone’s throw from Corona Heights Park. They’d been warned that something exactly like this could happen, by multiple sources, and they took action to prevent it. And yet, here they were, watching it all unfold—and powerless to keep a woman from being killed. The door to the home was answered by Ragsdale’s mother, 76-year-old Martha Alfaro, who went downstairs to fetch her son from his room. The police couldn’t help but notice that Ragsdale was wearing a pistol on his hip. One of the officers patiently informed the armed man “he was just going to remove the handgun for his safety and ours.” When queried if there were any more weapons in the house, Ragsdale answered in the affirmative. This was very true. 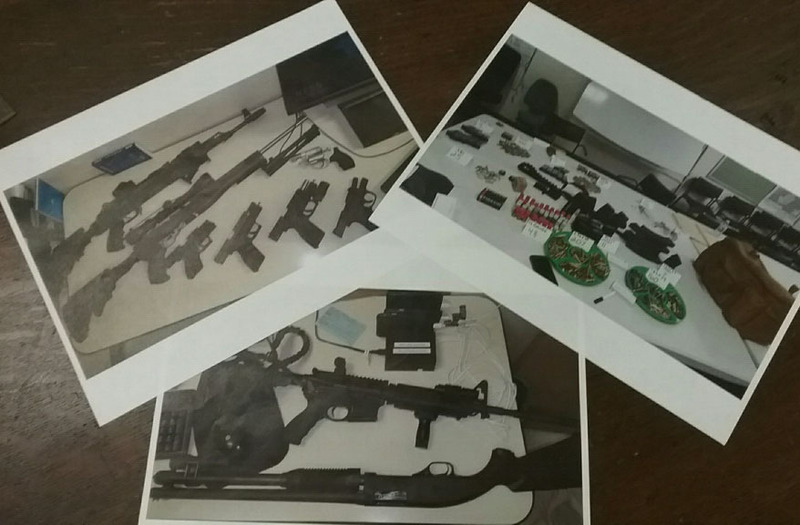 For some reason, the police evidence photos of what they discovered aren’t all in focus, but you can still make out what’s there: guns, guns, guns, and more guns. “Strewn about the room” were nearly half a dozen pistols, a shotgun, and three rifles, including an AK-47 that, in its unmodified state, is not legal to possess in California. There was a ghostly white bulletproof vest. And then there was the ammunition: Nearly 50 magazines, many of them larger than legally allowed, and a militia’s worth of loose bullets and cartridges piled into ammunition box after ammunition box in the garage. All told, there were nearly 28,000 rounds of ammo found on-site (that is not a typo). This is a concerning amount of firepower to randomly store in your room and garage—but even more so considering what Ragsdale said next. He told the officers that his neighbors wanted to kill him and his adult son, and he could hear their voices through his bedroom wall as they hatched a murderous plot. Police contacted the elderly, female neighbor. She did not know Ragsdale. She did not want him dead. Ragsdale’s adult son claimed “the neighbors were not out to get him and his family and it was all in his father’s head.” Ragsdale’s mother said she feared for her son’s safety because “she believed he was hearing voices” and worried he would harm himself or others. The mother of Ragsdale’s child claimed Ragsdale was “suffering some type of mental illness” and also worried he’d harm himself or others. Ragsdale was placed on a 5150 mental health hold and transported to San Francisco General, where he was subjected to a mental health evaluation. But by June 9, a doctor informed the SFPD that Ragsdale was ready to be transported out of the mental health ward and taken to County Jail No. 1. There he was booked on 13 misdemeanor counts of possession of high capacity magazines and a count of possession of an unregistered assault rifle—a felony. Subsequent paperwork, however, indicates all 14 of these charges were discharged, pending further investigation. He was free by June 13. The police have not yet publicly named Ragsdale as the man who held them at bay for 15 hours and, allegedly, shot a woman at 2443 15th Street. But that was the home he lived in with his 76-year-old mother, Martha Alfaro, and the SFPD has divulged that the man they took into custody was, like Ragsdale, 52 years old. The Medical Examiner confirmed to Mission Local that the woman killed on the scene was, indeed, Martha Alfaro, Ragsdale’s mother, who told police she was concerned that her son would harm himself or others. The SFPD has also confirmed that the alleged shooter is Alfaro’s son. So, it seems clear what has happened here. What’s less clear is why. And how. In 1972, the California Legislature passed the Lanterman-Petris-Short Act, which was subsequently signed into law by Gov. Ronald Reagan. With the stroke of a pen, the forcible institutionalization of the mentally ill became far, far more difficult. It’s hard not to argue that this was one of the most consequential pieces of legislation in state history. That’s apparent for anyone who walks through a major city or takes public transportation. It certainly played no small role in the goings on at 2443 15th St. Prior to Lanterman-Petris-Short, the insistence of three family members and a nod from a psychiatrist and judge could likely have had Ragsdale indefinitely committed to a mental hospital, whether he liked it or not. But the state has pulled a 180 when it comes to the civil rights of the mentally ill.
As such, Mission Local has learned that on June 9, city mental health officials’ efforts to have Ragsdale detained for more than 72 hours were derailed by a mental health hearing officer, who did not feel probable cause had been met to keep him in custody. With his case then shunted from the mental health to the criminal side, a similar outcome transpired. For the mentally ill, gun owners, and, as it turns out, mentally ill gun owners, individual liberties are valued more than the potential safety and well-being of others. The DA’s office claims it did not have probable cause to charge Ragsdale without definitive proof he did not own the offending guns and magazines prior to the date they were declared illegal. He was subsequently freed. The police may yet provide that proof, but the point now seems somewhat moot. Whether Ragsdale is the man responsible for his mother’s death will be a matter for the legal system to decide. But the gun that killed Martha Alfaro was not one of the ones collected by police; Ragsdale’s problematic trove of weapons is still sitting in storage at a police station. In Ragsdale’s case, “you can say they made a mistake. Or you can say they protected his rights.” Or, you could say both.